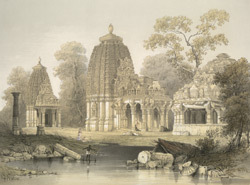 This is plate 7 from James Fergusson's book 'Ancient Architecture in Hindoostan'. Baroli is a tiny, beautiful site near Chandravati and Jhalarapatan in Rajasthan. The 10th-century Hindu temples pictured here are considered some of the finest examples from the Pratihara period in western India.